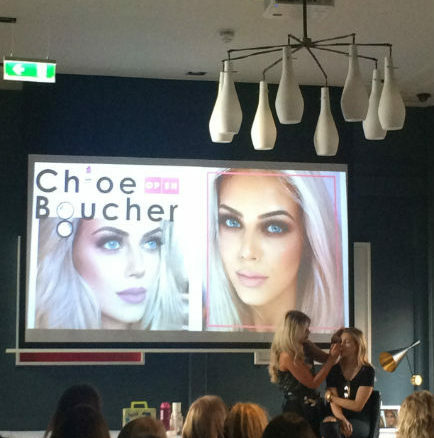 Dublin-based makeup artist and blogger, Chloe Boucher, recently teamed up with OPSH, the online shopping medium, for her latest masterclass. The event was to celebrate OPSH’s collaboration with Benefit cosmetics on their website. Boucher demonstrated to the crowd that you can get the perfect makeup look without the cost of high-end makeup brands. The cosmetic brands used included Bourjois, Catrice and Rimmel, a lot of which the makeup artist admitted to keeping in her professional kit. Boucher used these drug-store products to create a warm, sultry, brown smoky eye with a natural complexion. “I learned so many tips and tricks from watching girls on YouTube,” she told the audience. Chloe now has hundreds of thousands of followers on social media. One tip that she over-emphasised on the night was to always put your foundation around and on your ears to give a more connected look to the neck and chest if you’re wearing fake tan. She also mentioned that for a more full-coverage finish, to first apply a light layer of foundation, leave it set for 20 to 30 seconds, before applying another layer. She also demonstrated the latest makeup trends such as strobing, contouring and highlighting. Each guest came away with a goodie-bag full of vouchers and cosmetics. There was also one winner of a €200 hamper full of Benefit cosmetics given away to the best tweet or Instagram post using the hashtag #OPSHPresentChloeBoucher. Also speaking on the night was Justine King, a freelance fashion stylist and Creative Officer at OPSH. Both spoke about their rise to success in the past few years and also took a Q&A segment at the end of the show. “Never, ever did I imagine I would be doing masterclasses for girls,” Boucher admitted.